The Carlisle Conservation Foundation (CCF) is a non-profit, volunteer organization dedicated to maintaining the rural character of Carlisle and preserving its natural beauty and wildlife habitat. Working with private landowners, public entities, and other local and regional land conservation organizations, CCF serves as a resource and catalyst for land conservation, responsible land use, and community education about conservation. 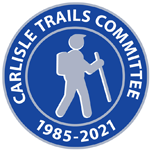 The Carlisle Trails Committee was formed to provide the community with information and opportunities to enjoy trails, to maintain the trail network, and to plan and preserve trails. At the heart of the committee’s work is the belief that a network of open trails benefits both individual residents and the town as a whole. Our trails are a treasured resource & an important element of Carlisle’s rural character.